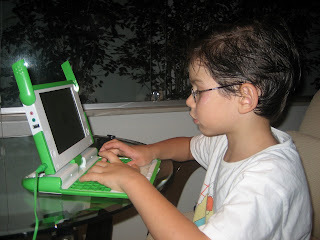 I asked for and got an OLPC to test and work on. My first impressions are very favorable. It's very small and cute and something that kids are immediately drawn to, because it's not adult sized. My 6 year old son has been playing with it on and off and I just saw him today explaining how to play on the laptop. I even overheard him saying that the laptop connects to other laptops which he must have overheard me mentioning to someone else. The keyboard is very small, but it's perfectly acceptable for two finger typing. My only complaint is that the space bar and enter keys have dead areas in it, but that ought to be fixed pretty soon. The biggest complaint from my son is the trackpad. He was almost brought to tears trying to use it. It was frustrating for him because he would try to move right and it would move left. Even build 303 seems to have that problem on occasion. I never had problems with it, but I'm more used to using a trackpad. It looks like he was starting his finger on the stylus area and then moving on to the trackpad which confused the laptop. There is still some heavy development being done in this area and will probably be resolved soon. The display works briliantly even in bright sunlight. 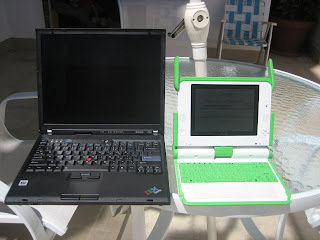 You should be able in the picture below that with the OLPC you can see the Google search page and on the IBM you can see nothing. I took this picture in bright sunlight that would be too bright to even read a book comfortably. I'm glad to be involved in the project and hope that I can make a positive contribution in some way. I ordered mine as soon as they were available, can't wait to get it! !